Publishers Description: It says quite a lot about Jeremy Johnson Johnson that the strangest thing about him isn’t even the fact his mother and father both had the same last name. Jeremy once admitted he’s able to hear voices, and the townspeople of Never Better have treated him like an outsider since. After his mother left, his father became a recluse, and it’s been up to Jeremy to support the family. But it hasn’t been up to Jeremy alone. The truth is, Jeremy can hear voices. Or, specificially, one voice: the voice of the ghost of Jacob Grimm, one half of the infamous writing duo, The Brothers Grimm. Jacob watches over Jeremy, protecting him from an unknown dark evil whispered about in the space between this world and the next. But when the provocative local girl Ginger Boultinghouse takes an interest in Jeremy (and his unique abilities), a grim chain of events is put into motion. And as anyone familiar with the Grimm Brothers know, not all fairy tales have happy endings. . .
Goodreads gives this an average user rating of 4.06. Low raters complained about it not being dark enough or too dark. One dipshjt rater said, “It must have been as confusing as I think it was because I’m obviously still too confused to figure out if it was really that confusing. Does that make sense?” Well no, you don’t make sense, to yourself or that herd of baboons. Maybe this is some cry for attention using Goodreads as a conduit. Save your plaintive ministrations for your Goth boyfriend and bandage your cuts. Ok, enough about egocentric d-bags. I Loved this novel. Brilliantly crafted, from the characters to the story-line. The ghost enables an overview of events that leaves you pulling for Jeremy and Ginger at every twist and turn. Most novels in general have some characters that get left out of the development as they are just filler for the reader. 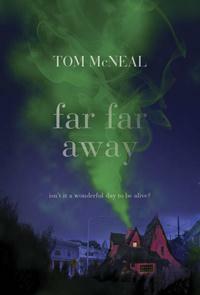 Tom McNeal makes every effort to include some sort of insight into every person in the story, that makes for a riveting read. Pretty easy to figure out the baddy, but then again, this was a “made for young adult” novel. Please do not pass this one up as you might miss out on a real talented writer, whom takes you on an escapist journey of wonder. Publishers description: In the mid-23rd century, Darwin, Australia, stands as the last human city on Earth. The world has succumbed to an alien plague, with most of the population transformed into mindless, savage creatures. 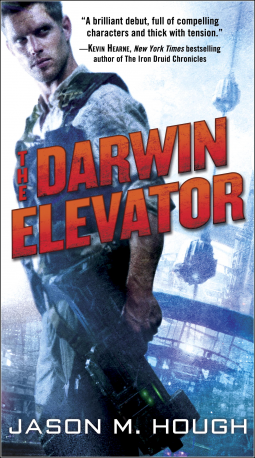 The planet’s refugees flock to Darwin, where a space elevator—created by the architects of this apocalypse, the Builders—emits a plague-suppressing aura. Review: This is hard sci fi at its best. You fumble along for a while with Skyler making dumb choices….or none at all, which is just a great human element to the story. Following the characters through the scenes creates a sense of despair and tension not readily found in most novels, regardless of genre. The author uses the term ‘Jacobites” quite a bit, in an attempt to label a religious cult tied to the alien ladder (Jacobs ladder). He never really delves into the psyche of this cult and besides the pejorative use of the term, there are no new definitions that are usually found in hard sci-fi. A bit disappointing, but minor in that regard. Some of his descriptions are a bit off. When he describes Samantha she is a VERY tall woman. Then in the next paragraph she is stocky. Just a bit inconsistent at times. The cover just sux azz. As the story unfolds you picture Skyler as more cerebral and unsure of himself, not rugged action hero dude with a space blaster hanging by his side. Publishers’ need to understand that COVERS SELL BOOKS! Not always, but mostly. 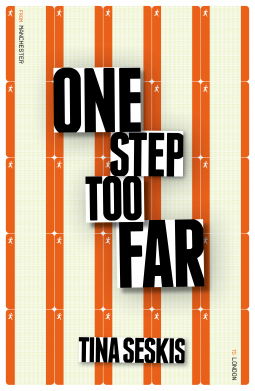 Make the cover fit the theme of the novel. The space elevator in the background needs to come to the forefront so it captures the imagination. Kind of like Larry Niven’s Ringworld cover (pick any). The Dire Earth series has a set of covers that will be released in the UK, that are way frickin’ better than the US release, but not by much. Did I say I loved this novel…no? Well I did. It was riveting, full of action, great character and story-line development and just plain fun. Like really good scifi, as you read, other creative ideas seem to come to you in the midst of catharsis. I like that, a lot. So few sci fi authors have evoked this type of sub conscious response to their writing. Ones that I can name are: Larry Niven, Jack Chalker, Asimov and Brian Daley (deceased). Jason, you are in good company. 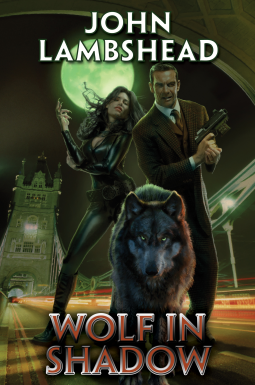 Publishers Description: Rhian, a girl from the Welsh valleys on the run from tragedy and herself, finds a new home in the modern East End of London, where the world’s largest financial center spins a web of money and power from glistening towers of chrome and glass. Beneath the digital façade lurks the old East End where the layers of two thousand years of dramatic and violent history slide over one another like glaciers, spilling out in avalanches that warp the real world. As bodies begin to litter the East End streets, The Commission dispatches its best enforcers to deal with the situation: Karla is not human, and Jameson left his humanity behind in pieces in Northern Ireland and Afghanistan. Rhian makes new friends, dangerous friends; and where Rhian goes, the wolf is always in her shadow, just a heartbeat away. Review: The Publisher’s description does not do the novel any favors and in no way should be the determinate factor in selecting/purchasing this book. The cover is really weak and needs to get with current times. This can be a selling point for buyers whom may look at this cover and consider it an “Underworld” type novel. I love this writing style…to the point. You get right into the nitty-gritty and the action ensues. Character development (mostly) is very good with the limited time spent writing about it. The author just gets enough in to let you take it from there. The author gives you the reigns of imagination and lets you ride where you will. A refreshing take on writing that may take some getting used to. Some reviewers didn’t like the abrupt style and sudden info dumping, without a lot of buildup. But you decide. Get this and keep an open mind and I think you will enjoy it. Publishers Description:Marine archaeologist Jack Howard has made an astounding find in the depths of the Red Sea: proof of a mass suicide by a pharaoh and his army. But what could have driven the most powerful people of their age to hurl themselves to their deaths? What terrible new king, revered as a new god, came to take their place? 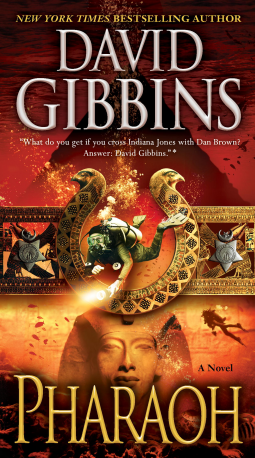 Howard’s search leads back through the ages to the discovery of the vault of Tutankhamun in 1928, the legacy of American adventurers in Egypt, the fate of General Gordon’s doomed garrison in Khartoum—and a long-shrouded catastrophe that saw a unit of Gordon’s would-be rescuers swallowed by a mysterious Nile whirlpool. Between the story told by a crazed survivor of that horror, a lost labyrinth, and the truth behind a three-thousand-year-old conflict, Howard is on the verge of a discovery that will change history—for good, for evil, and for the future of all humankind. Review: Pharaoh is one of the biggest disappointments in my experience. Especially when I had high hopes for the new release to capture my minds imagination and whisk me away to LaLa land. Approximately 90% or more of the novel is a historical account set in the late nineteenth century between the war of the dervish and England in Khartoum. You will mostly follow the life of Major Mayne during this time, whom briefly bounces into the area that concerns our intrepid boyo, Jack Howard. There is absolutely NO ACTION in this novel with Jack Howard and Costas. It is all set in the past, during an important time in history to the author (I am sure), that has no relevance to the intended story-line. Not only is this novel pure shjt, the author shovels this self-indulgent crap on top of it with the author’s note….”The Gordon relief expedition has always fascinated me because of my own family connection with the story…..” And there you go. The whole reason to write a historical account. I guess you can use a popular vehicle (Jack Howard) to foist your wares on the unsuspecting, but keep that shjt away from me. I don’t know what happened to this guy (Gibbins). He should have wrote a totally separate non-fiction novel, and called it “Major Mayne, not from Spain, in the Land of No Rain”. I wonder who patted Gibbins ego on the back for promulgating this disaster. Readers are fickle, and they fall in love with the characters, such that they become like family. When the author kills off beloved characters or even approves short actors (Tom Cruise) to play bigger than life action heroes (Jack Reacher), they lose a ton of devoted readers and subsequently, money. Don’t waste your time or money on Pharaoh, as it has nothing to do with the Jack Howard adventure series. 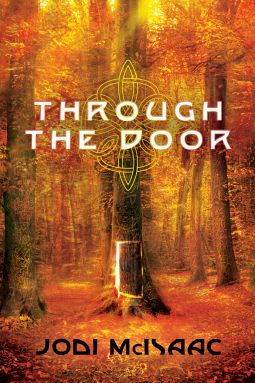 The first in the Thin Veil series, Through the Door is a pulse-pounding adventure that takes readers across the globe and deep into the hidden realms of Celtic lore. This novel had good pace and action throughout, which kept you involved. Coupled with a good story-line and somewhat engaging characters, made for a quick read. Some online reviewers did not like how information was kept from Cedar McLeod by her extended magical family, but remember you are looking through the eyes of Cedar as the story unfolds and to get the whole story in one dump would change the outcome. There are a few stumbles in the story with the abrupt end of Lorcan and some character’s that were pertinent to the story but lacked sufficient development. Plus a few grammatical errors for a finished work that should have been cleaned up by the editor(s). Well thought out work. I am curious to see how the author involves Nuala and whether Cedar gets some interesting powers now that “humanity” has left her. The next in the series (Into the Fire) has a release date of December 2013. Get on the list if you haven’t already. 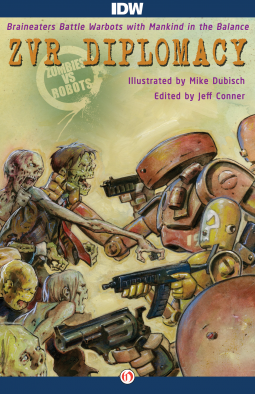 Publisher’s Description: Zombies vs Robots Goes International! It’s the Cold War in Hell as undead flesh clashes with uncaring metal. The zombie apocalypse is a true global conflagration, and ZvR: Diplomacy is at the frontlines with a collection of original stories either set in Russia or the UK. On all fronts rabid braineaters battle gleeful warbots, with a beleaguered (and dwindling) mankind caught in the middle. Featuring original stories by today’s leading perpetrators of zombie terror and robot rampage, namely Steven Lockley, Rio Youers, Robert Hood, Gary McMahon, Ekaterina Sedia, Simon Clark, Dale Bailey, and Simon Kurt Unsworth, ZvR: Diplomacy is a unique new chapter in the ongoing Zombie vs Robots prose program, and is fully illustrated by horror-master Michael Dubisch. This is a collection of short stories by current zombie/robot authors. Most of the stories are really pretty good, with some kind of falling at or below the mark. Usually with short stories the author has an easy time keeping the reader engaged with fast pace and lots of action. Really not much to say here. I prefer novels to shorts but I think you would still be entertained by this collection. Publishers Description: An apparently happy marriage. A beautiful son. A lovely home. So what makes Emily Coleman get up one morning and walk right out of her life to start all over again? Has she had a breakdown? Was it to escape her dysfunctional family – especially her flawed twin sister Caroline who always seemed to hate her? And what is the date that looms, threatening to force her to confront her past? No-one has ever guessed her secret. Will you? Wow! Ba-zing! Sky rockets in flight! In case people out there who wonder who Kirkus is, it is a review service that publisher’s and author’s PAY to have their shjt reviewed. An express service review by Kirkus costs about $600. So lets see, if I PAY you to review something, the expectation is that it will come out better than say, paying nothing to Koeur for an honest review. So lets get to it! (I am soooo excited). This is the purest form of inner-dialogue writing, perhaps in all of existence. In so much, that the puking that ensued was conjoined with my collegiate poisonings of the past. This novel read like a bad day on the Titanic….being seasick then hitting an iceberg. I am astounded that anyone can write a whole novel that is almost, but not quite, a person talking to themselves. The cover art looks like Queer Eye for the Straight Guy redecorated a jail cell. If you’ve turned one page of this disaster you’ve taken one step too far.